The Taming of the Glue: An Excuse to Visit the Pub! Good Morning All and a very Happy Wednesday! This is only a very quick post as I'm off on my travels. Did you all enjoy the blog hop yesterday? The Couture Creations 3 in 1 sets were great to play with. 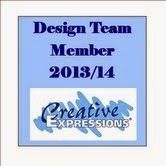 Anyway, I'm doing a step by step on the Creative Studios Design Team blog today using a beer mat. I hope you pop over there and have a look. I'll still be blogging with new projects a couple of times a week while I'm away so do please come and visit! And of course, I always enjoy all the comments you leave. If we reach the magic 300 followers, I'll do the draw when I get back (on 18th December). Until next week, have a happy, crafty time!